the pink toque. 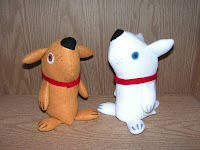 a craft blog: Spring Purse & Stuffiepups! 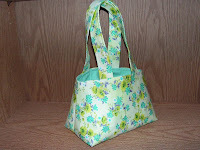 Thanks to craftymumto2, I was inspired to make a spring-y purse. I made this one today, and have decided to give it to my mom for mother's day. Ya, I know mother's day is still months away, but when you find the right fabric that just seems to fit... you go with it, ya know? I think she'll like it. I used the glass pendant technique to make a matching zipper pull from scraps of the outer fabric, but since there aren't any zippe rs on this purse, I've just tied it decoratively to one of the handles instead. I love it! 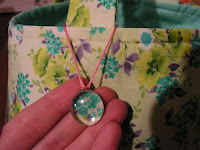 I made a bu nch of the glass pendants to be used as zipper pulls yesterday with my logo on it to use on purses I sell. 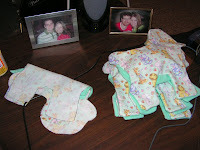 It was a fun project and Lucas helped me out while we watched hockey. (Yay, the Flames beat the Blues!) I'm still working on those lambs, albeit slowly. I'm in the mid dle of too many crafting projects I think. Is that even possible? Right now the fourth one is waiting to be sewn together on the sewing machine, and the three others are waiting to be stuffed and sewn shut. And they'd probably like me to put their ears on, and give them eyes and a nose. Lamb stuffies are so demanding! I absoultly love you purse imade another lmao I need to stop hahaha.. I just love the new crew Dennis and doug they are adorable.. I have a spot for him heheh .. I finished the thing im sending you >> HINT IT'S a TEDDY lmao..